I love hiking with my baby. I love being outside, I love being with friends and I really, really love knowing my daughter is growing up with an appreciation for the outdoors. Hiking with a baby isn’t always easy. It takes a lot of planning and foresight to get it right. Once you get it right, everything falls into place. Over the last 7 months, since we took Ella on her first hike at 6 weeks, I’ve really started to dial in what works and what doesn’t. 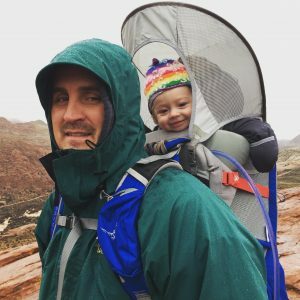 I personally began with the Ergobaby 360 Baby Carrier and then moved on to the Osprey Poco Child Carrier as Ella got older. 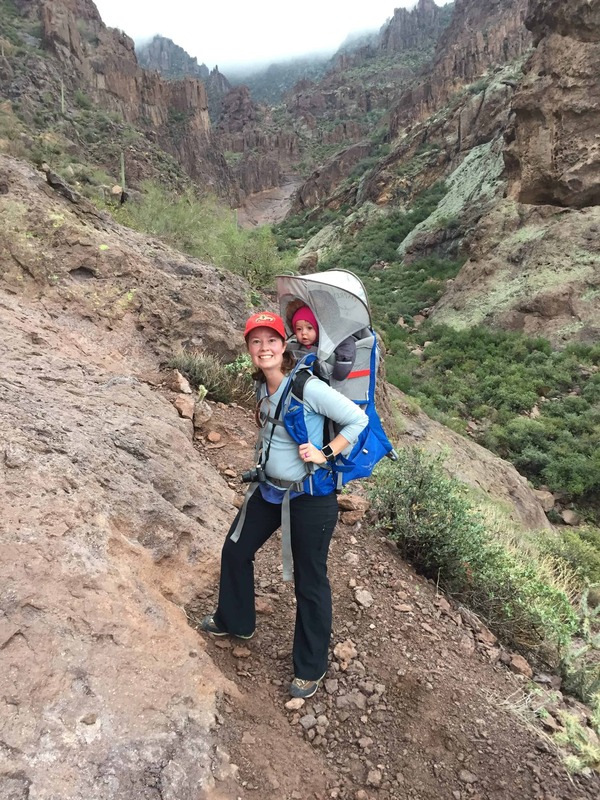 When Ella was small hiking with the Ergo baby carrier was awesome. It is super comfortable and was easy to adjust the sizing between myself and my husband (I’m 5.1 & he is 6.1 so this is a big issue for us). 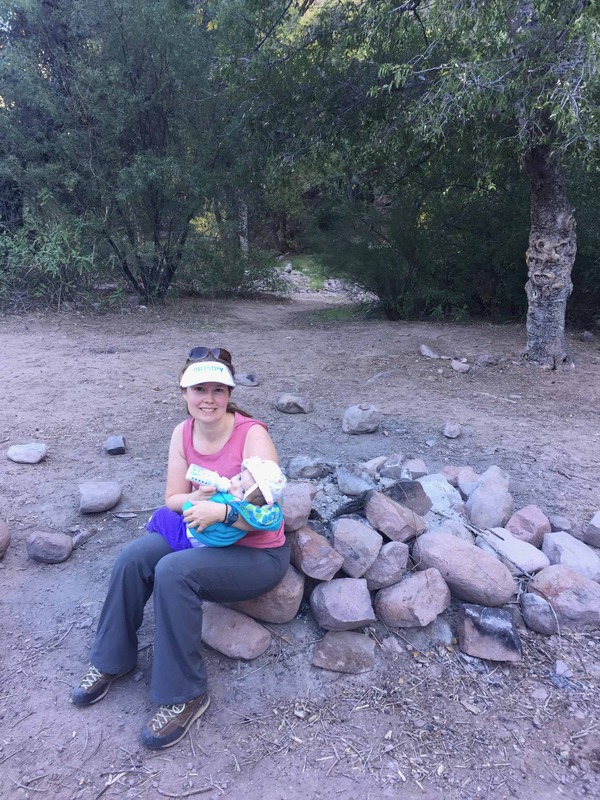 For a small baby, I recommend the Ergo Baby carrier for hiking. I tried using a sling once and don’t recommend that route. I couldn’t get it tight enough and felt like Ella was constantly shifting. Once your baby gets a bit bigger, the pack becomes really important. Carrying a little human on your back is a bit different than a bunch of gear. This is especially true as they get older and want to move. You need a pack that distributes weight well and conforms to your body. I have loved the Osprey Baby Carrier. I’ve used two other carriers in the past with friends kids and can’t believe the difference. My back doesn’t hurt and I’m able to cover some pretty significant distance without knee issues. I wrote a detailed review of my experience with the Osprey Carrier if you are interested in this product. The nicer packs can be very expensive, but I’ve seen them at used baby stores, on Craigs List or the facebook marketplace. Start looking as soon as you get pregnant and I bet you’ll be able to find a good deal. You also want to take your child’s comfort into consideration. When Ella is comfortable she is a much happier baby. She doesn’t cry or get fidgety. She also seems to really like being up high so she can see everything. 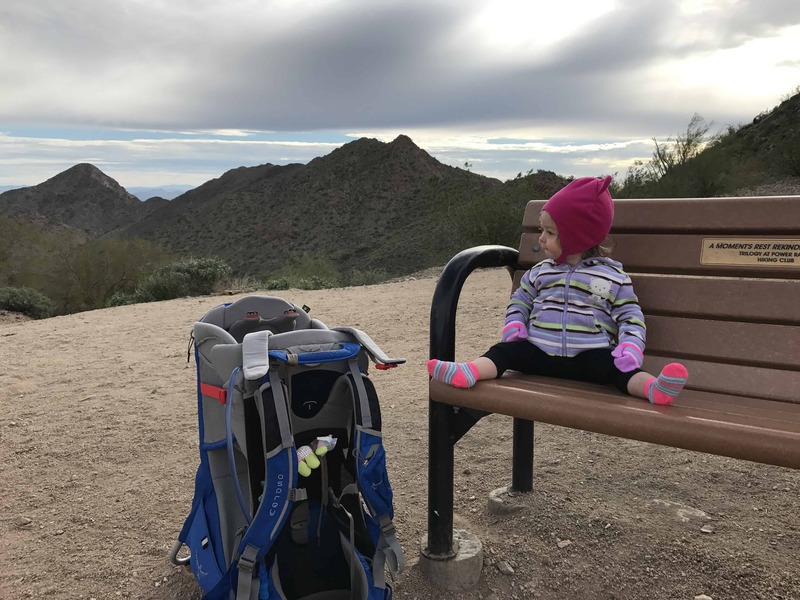 ***Editors note: Ella is now 18 months old and I’m still going to recommend the Osprey as the toddlers hiking backpack carrier. She gets excited when I pull out her Osprey carrier and last week tried to climb in it by herself. We’ve covered a lot of ground in her pack and as she’s grown it has gotten even better. I learned this lesson very early (by mistake of course). My goal is to either feed Ella on our way to the hike or just before we leave the house. I want her completely stuffed full of food. This gives me 2-3 hours of hiking without having to worry about feeding her. Now that she is a bit older, I keep little baby snacks in a side pouch for easy access. If she gets a bit fussy, I hand her one and she is usually fine until we stop. On a side note, if you go this route expect to get crumbs or worse in your hair. Which on a side note, for the girls reading this – I recommend hats and braids. It won’t stop all the hair pulling, but at least makes it kind of manageable. That is life with a baby. I keep Ella’s pack permanently packed and I still have to double check myself each time I go. The times when I’ve tried to pack in the morning as I’m rushing out the door I always forget something. Prepare in advance, it will save you a lot of stress out on the trail. Again a lesson I’ve learned the hard way. Enough said, don’t skimp on the diapers. Also on a related note, wipes are your best friend. I’m not a clean freak (hello I’m hiking), but I do like to at least try and be semi-sanitary when I’m feeding her. Wipes are about as multi-purpose as you can get. I hike in Phoenix, so I always, always, always bring extra water. Having a dehydrated baby isn’t worth it. Ella is just getting to the point where I can kind of get her to drink out of my bladder. It isn’t pretty, but at least I know I can get her to drink. On a side note, watch your baby if they have teeth. My friends have lost a few hoses to teething babies. I actually tie her sippy cup to the side of my pack (I just use an old shoelace). She loves playing with it as we walk and tends to drink more water. These are the kind I use, they have a nice little indent that holds the tie in place and I like the silicone nozzle so that it is soft on her skin as we walk and she drinks. I’m 5.1 and weight 120 pounds – I’m still trying to get that last little bit of post-partum weight off. Based on my weight, I really shouldn’t be carrying more than 20-30 pounds. Ella is lightweight at only 16 pounds, my pack weighs 8 pounds . . . . you can see where this is going. Pack light with a baby. Most of you are laughing right now – there is no such thing as lightweight with a baby. Some supplies you just have to take and that is life. Still, try and save pounds/ounces where possible. I’m lucky enough to have friends that are willing to carry some of my weight if needed, but my pack is still typically 30-32 pounds. I’m not looking forward to when Ella starts packing on the weight. This is for two reasons, one it gets you into hiking shape so that as your baby grows you are used to the added weight. It also helps your baby. I had some friends who put their baby in a carrier for the first time at 18 months old. Let’s just say she wasn’t happy and it was a very tough trip on all of them. I’m not sure how Ella will behave as she gets older, but for now, she is very used to the pack and actually gets excited when I put her in. She loves going for rides and will wave at people and babble to her heart’s content. Right now the vast majority of my hiking is done in 2-3 hour increments. Regardless of how I feel, I need to stop periodically to give Ella a break. I just factor this into my planning now. It is kind of a hassle and drives me nuts (I like to just go), but she needs a break occasionally. I also assume that when I stop it is going to be around 30 minutes. By the time I get her out, let her play in the dirt (another reason for extra wipes), give her some food, take 10-20 rocks out of her mouth 30 minutes has flown by. Babies need that recharge time. 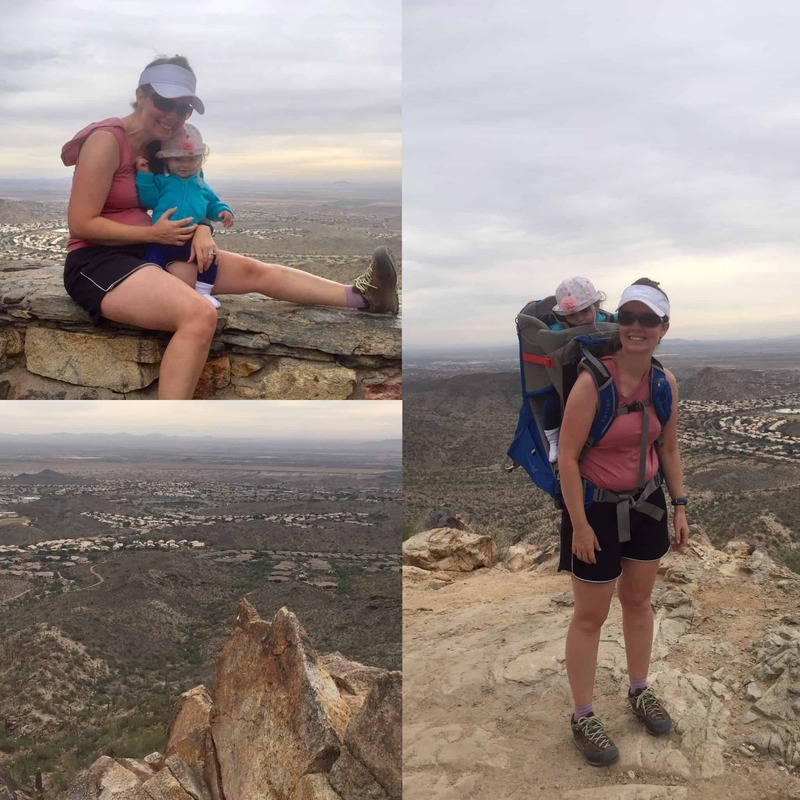 I was not a fan of hiking poles until I started hiking with a baby. They just seemed cumbersome and always seemed to get in the way. I’ve completely changed my tune since I started hiking with Ella. Hiking poles are the absolute best when going up and down steep rocky trails. 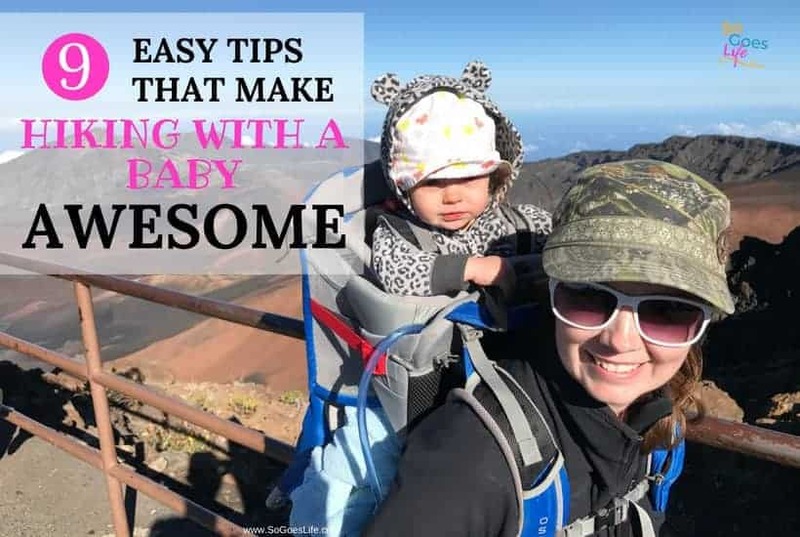 They give me a ton of stability which makes hiking with a baby significantly safer. Baby’s don’t always stay stationary in your pack and when they move suddenly at the wrong time it can be kind of scary. Using hiking poles has really helped me feel more comfortable particularly when I’m doing steep hiking. They also do wonders for my knees. I try not to be a gear snob, but don’t go cheap with your hiking poles. Go to REI or an actual outdoor store and make sure that they are sized correctly to your body. These are the Black Diamond poles I use and I love, love, love them. #helpfulhint – If you are small consider getting kids poles. They are typically cheaper, lighter and they work awesome! If you are planning to stick with light hiking on good trails, I don’t think they are a necessity, but if you want to get off trail or do anything with elevation spend the money and get a nice pair. I feed Ella before leaving the house and then give her a bottle as we drive to the trailhead. I check her diaper and then add layers of clothing/sunscreen as needed based on the weather. Once I know she is ready to go, I’ll pack her up and hike for 2-3 hours. When she starts acting hungry, I take a nice break and stuff her full of food again – hopefully, avoiding a diaper change. Then I hike for another 2-3 hours back to the vehicle. To date, I’ve never had her in her pack more than 6 hours in a day. Most of the time, I limit it to 3-5 hours. I’d like to hike longer, but am working my hiking schedule around her needs. As she gets older I may adjust, but for now, she loves being in the pack and I love being outside, so it is a win-win situation. This list varies based on the length of the hike and difficulty level but this is a good starting point. I’ve found the baby food pouches are the easiest food on the trail. Bottle – I pre-measure my water so I’m ready to go. Pacifier – I use the Wubbanub pacifiers and then tie it to the outside of my pack with a shoelace for easy access. Sunblock – I use the Babyganics Sunscreen. I’ve found a snow suit is one of the best ways to keep a baby warm when the weather is cold. When hiking I’ve found it is best to dress Ella in light-weight stretchy clothing that is easy to layer. I always choose her longest pants with high socks since her pants tend to ride up in the pack. I also dress her in a long-sleeved body suit that is loose fitting. I like the onesies because it won’t ride up and leave her stomach exposed. I also keep them loose fitting because I live in Phoenix and it can get really hot. Now that she is getting a bit bigger I also use the little moccasins to keep her feet warm and protected. I found some ultra cheap ones on Amazon that are 3-5 dollars. They aren’t going to last you long, but they are perfect for growing babies that only wear shoes occasionally. During the winter I bought her a snowsuit and bundled her up in it a couple of times. I don’t worry as much when I’m using the small Ergo baby carriers since my warmth helped keep her warm. When she is in the big baby carrier she has minimal wind protection and I’d rather keep her too warm then have her get a chill. Don’t be afraid to get outside with your baby. Yes, it takes planning and you have to be incredibly careful. However, I feel that the benefits of being active and outside outweigh the potential dangers. Get out and enjoy life and let your baby get used to being outside as well. PS. I also wrote a post about How to Survive Camping with a Baby. 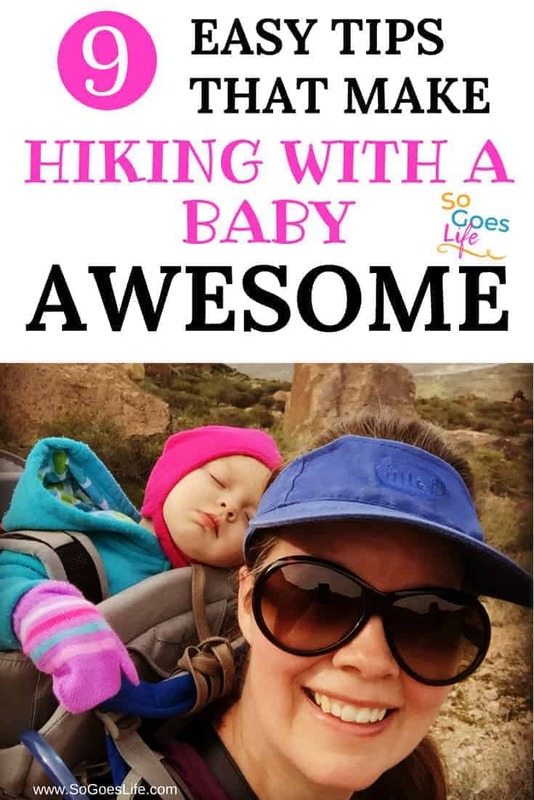 If you can hike with a baby, you can definitely camp with a baby. You may also want to check out How to Fly With Your Baby. Hello! I'm Amy White and I'm glad you are here. Please join me for advice on parenting and managing a home in this crazy world!